Aaah, now I understand. So were not taking anything away from her but even helping her - and while you didn't get nearly the money you'd usually get for this amount of work, a part of your reward was in the reading itself. So you even performed a good deed and were enjoying yourself at the same time. I've done my 21st blood donation this morning - starting the second bucket. Oh my... you must be bloodless by now! Yeah, 10.5 liters in total sounds quite a lot, eh? I am moving to the new flat on next Saturday! 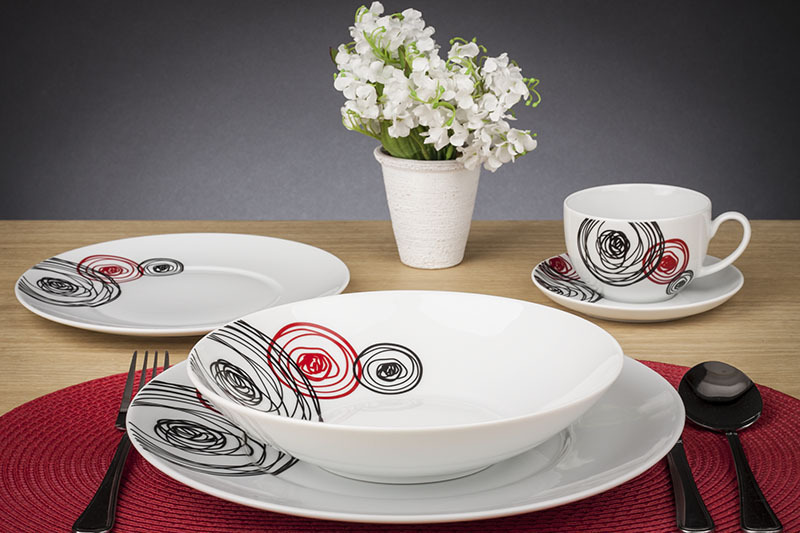 And because of the fact mentioned above, I've ordered 2 sets (each for 6 people) of the dishes and cups! ps. Some bathroom and new doors photos! It's warming my heart how nicely you are building your nest. I wish you all the best to your new living! Thank you! Today the furniture: table, chairs, tv table arrived! And the vacuum cleaner. I've washed the dishes Tomorrow we get the new locks in the front door and the tv/Internet connection. On Saturday the bed and rest of the stuff like boxes and we're there! I promise to upload some new pics after the weekend! I'm so glad because we have 7 times better Internet connection that we used to have in our previous home and it's very cheap (when you sign the agreement for 2 years ). TV works great! Well, usually, when you start taking drugs for thyroids, it's forever... That's the reason I'm crossing fingers to keep my values normal for. But, as far as I know, if you're in your doctor's hands, there must be no problem. I even know one colleage of mine who has no thyroid, as it had to be removed. And I know because I was told of, as I've never seen any problem with her. Sometimes the thyroid must be removed because of the changes in it (some tumors inside etc.) I guess that your colleage must take hormones..
Lucky me, so far I take the smallest doze of the hormone, another bright side is that this medicine is veeery cheap here - ~6 PLN for the box of 50 pills (1,5€). Btw. Do you know that when you are pregnant (or want to get pregnant) you MUST control the thyroid hormones' values? I've got informed that unhealed thyroid problems might cause e.g. problems with getting pregnant or abortion, or the baby may have thyroid problems too, or if the baby is born healthy, might in have the problems with concentration and learning in the future. It is VERY IMPORANT TO CONTROL OUR THYROID HORMONES.. Yes, I suppose she might take the subsitute for the thyroid. And I know a lot of people who is taking pills because they've hipo or hiperthyroidism. In fact, as I say, I cross my fingers I last to have to, as I've been told I'll eventually have some problem (probably hipo). Maybe you are right, Luth. In my case it's rather hipo. I hope you won't have the problems with thyroid. I am sorry to read about your health problems :-/ I myself am supposed to go to the endocrynologist every year for check up too. Because my thyroid seems to be rather lazy. Also we have this problem in family - my grandmother had her thyroid removed and had to take some pills still. Yes, it has to be checked during the pregnancy. It may get crazy even with a person who never had problems with thyroid before. So the doctor already told you that you will have to take the pills in longtermed view? Hm, I also worry for getting pregnant cause of my endometriosis and few other problems. Just yesterday I found a new doctor for myself. Was sent for few tests and on July 14th there are some more. Haven't seen the doctor after the last blood tests, he told me to take all the pills he wrote (100 pills, today I took 50th). When I will finish the second box of Euthyrox (the med), I will contact him and show the test results.